Being punctual is one of the easiest yet difficult thing to achieve in the current world. As per a survey about 15%-20% are late to reach their offices. It disrupts the workflow of the place and also wastes other people’s time. The impact of punctuality is high which most of the people do not realise. By only reaching on time to the workplace, one can garner a lot of respect and attention to the superiors. Not to forget this also has a great impact on personal life too. It helps to finish the work early and leave office on time and gives space for personal recreational activities to do. This further will lead to a happy mind which will increase the performance in work place and chances of promotions then gets higher. 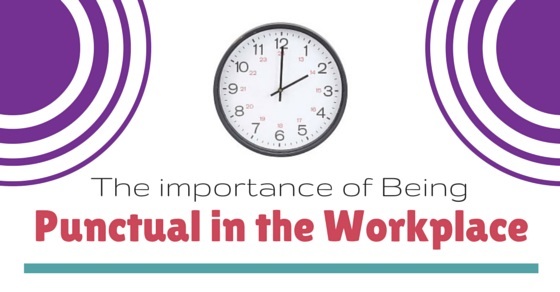 Below are 15 important factors of being punctual in workplace. Having a good punctuality is important also there are many benefits of punctuality. The below mentioned are few reasons that help you tell how important is punctuality. By reaching on time to office it shows your dedication towards work and portrays your interest in the company. Punctuality has become an invaluable asset to a company these days, and when someone does it right it helps to get easily noticed to the people. It presents you as a person of strong character and people will respect you for that. It helps you to know more and more people working there, for example, you might get a chance to interact with your CEO or might find some time to know who all are working there. A quick bright hello will make your and others day too. Punctuality shows that you respect your boss and people who are reporting to you. To become really successful in life, it is important to show respect to your seniors and juniors alike. This will also inspire others to follow your footstep and put an effort to be punctual, hence making you a leader. Reaching office on time helps to settle down from the rush in the traffic and it gives sometime to plan your day’s task to achieve. A good plan will make your job easier and will help you to finish all your work on time, making it easy to leave office on time and giving space to your personal life to enjoy. If there is a meeting to attend, then it will be good to revise quickly for it before entering the room, only if you are punctual. Also, saves time for the people in meeting and people can close it quickly without wasting time on it. In offices, work are generally in co ordination with each other. Suppose someone might be waiting for you to come and finish a certain task to begin further, you beginning late will hamper the whole chain of work and will delay the process too. As mentioned in previous points, punctuality also gives time to hobbies and recreational activities. It also reduces stress, because the work is done on time, hence reducing the unnecessary work pressure, and prevent you from blaming others of the situation. There importance of being on time are many. As in many companies, being late deducts the half day salary. Just by being on time, it will save your salary from deduction boosting up your confidence level. This salary can add up to your savings and expenditure, whatever you choose to do with it. Punctuality proves you to be a trust worthy and efficient person hence whatever you will say, your co workers and bosses will take you seriously. They might give you an opportunity to put up your ideas to them and let you take some additional responsibilities you might have been waiting for. Punctuality pays off well when you might genuinely require to take leave from the office. Since you are never late, this will be taken in high regards if you request for coming late to office, as this won’t be seen as an excuse in the eyes of your employer. As compared when coming late to office and giving excuses for it. Punctuality at a workplace boosts your confidence, since you can perform as per the commitment, hence your expectations can take a higher leap. Further it will give you self assurance on every task you do, since you won’t be dependent on old habits and excuses. The best part of punctuality is, since you are able to plan your day so you will be able to finish the work before the office hours, hence it will provide you an additional time to learn more about the company processes and about your own job role. This in future will get noticed and can affect you in promotions on positive note. Suppose you are looking out for a different job and they are almost ready to hire you. In the process of hiring, recommendation from previous and current employer is generally asked or even a background check is done. The first thing that is focused in these processes is about punctuality. Your punctuality will increase the chances of you being hired and the non punctual factor will harm in the decision making of hiring, no matter how good you are at your work. If you are a boss and are always late, then your employees will not take you seriously. One need to be a source of inspiration to others. To make your point clear to your juniors, punctuality provides power to your words. As a boss it is important to set high benchmarks to others to follow. Without which the sense of authority will be lost. In such a competitive world, an individual branding is required to stand out among the crowd. This branding opens up opportunities for future. Punctuality will make you a brand, since most of the people these days are not punctual. This will help you get noticed and you can easily brag about it to others. As mentioned, not everyone is punctual these days but if followed the rules of punctuality it will provide many benefits to the person. Initially it might be a task to achieve punctuality at work, but with gradual and consistent effort it be will be easy to achieve it. Not only in workplace, but incorporating punctuality in life in general will increase your respect among friends and families too. Once it becomes a part of your life, it won’t be a task anymore. The best practice to be punctual is to keep a time table and clock with you at all time or take some help from friend and family. Wear a watch all the time and keep a track of how much time you take to do a certain task or reach to a place.To be punctual is not a very difficult thing to do but it is one of the simplest and easier thing to achieve for greater benefits. Next articleJob Search Priorities or Goals – How to Set them Right?